Sitting in front of the Alhambra's Alcazaba. When the Sultans of the Nasrid dynasty chose to build a palace in the foothills of Sierra Nevada on the plain of Granada, they needed a fortress, of course, on the highest point of the hill, to keep watch over their kingdom and defend the royal family. The resulting Alcazaba, which just means fortress, still stands today and is one of the four ancient sites to visit in the magnificent Alhambra complex in Granada, Spain. Visitors may enter the Alcazaba with their ticket to the Palace Nazare and/or Generalife Gardens. Since the Alcazaba is right across from the entrance to the palace, plan to tour the fort before you enter the palace, and give yourself about an hour to see the Alcazaba. Remains of the living quarters inside the Alhambra's Alcazaba. What is there to see inside? Ruins mostly, of the living quarters, stables, and dungeons. The most fun is climbing up the defensive walls and watchtowers for expansive views over Granada. Awesome views of the city from the Alcazaba. Vending machine with soggy sandwiches. 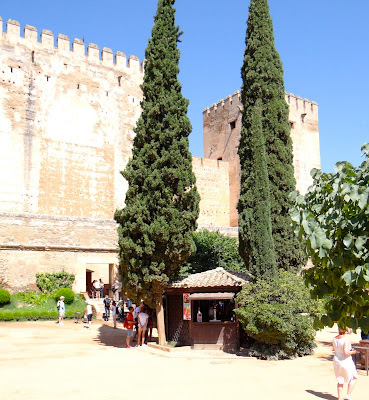 I have a tip to share about eating/snacking while visiting the Alhambra. The entire complex is enormous, and walking distances are far from one site to another. There are two sit-down restaurants within the Alhambra walls: the Parador de Granada restaurant and the Hotel América restaurant. If, however, you don't want a sit-down meal, your choices of snacks and beverages are few. After not finding anything, anywhere, we finally purchased a couple of soggy triangular-cut sandwiches from a vending machine in the small building that houses the restrooms. I'm not really a picky eater, but these sandwiches were truly inedible. Not until later did we find the small kiosk near the entrance of the Alcazaba that serves fresh bocadillos, beer, and other yummy snacks. I took a photo (below) so that you won't miss it. This kiosk is where you want to grab a sandwich at the Alhambra. And, since I mentioned the restrooms, DO use the ones near the vending machine and the Square of the Cisterns bookshop. They are the only bathrooms I found, they are free, and there is a balcony in the ladies room with a fabulous view over the plaza. Read Alhambra Part 3: Palace of Charles V here. Oh my, what fun this must have been. Great photos, of not just an interesting place, but what outstanding weather too! Vending machines are very compatible you can use it in any place where you want and enjoy healthy food and drinks with that. It provides you faster service as well you can use it at any time. Whether you are on a trip now this machine is available everywhere. Many westwaysvending-vending machine companies are available which provides you all types of rent and lease facility of this machine. Thank God for your post! We are going to visit Spain with my 8 & 10 yr old in less then 3 weeks. I find your blog is most helpful.